The Dapper Doughnut, a new-to-market franchise, has closed its one and only Atlanta area location in Lenox Square. 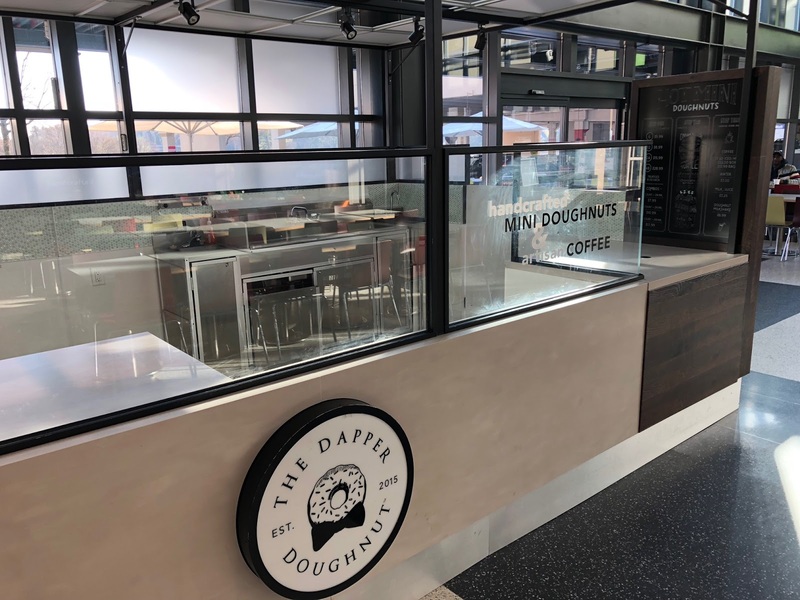 Opened by franchisees Bob & Donna Huntley and Richard & Tracey Holcomb, Dapper Doughnut operated from a kiosk on the mall's market level within the "Fashion Cafe," aka the food court. The Dapper Doughnut kiosk was at the front of the Fashion Cafe, along the wall between FIVE GUYS and The Farmer's Basket. The kiosk opened April 26, celebrated its grand opening late last June, and closed quietly last week. The closure comes on the heels of the recent opening of local operator Da Vinci's Doughnuts in a converted container in the parking lot at the front of the mall along Peachtree Road, near the Westin hotel. Da Vinci's, unlike Dapper, offers normal size doughnuts and is located in an area away from many food options, a good location for an impulse "snack" purchase like a doughnut. The closure of Dapper Doughnut is made less surprising by the fact that all four of the franchisees involved - The Huntleys and the Holcombs - had nearly eighty years of combined work experience, but none of that experience was in food service. "Although our family has had very different career paths we all agreed that we wanted our next venture to be unique and delicious" said the Holcombs of their doughnut venture. Restaurants are a very difficult business and the couples were no doubt drawn to the lucrative business opportunity presented by franchisors of The Dapper Doughnut.  The company claims that it costs about $.03 to produce a mini doughnut and the average retail/food truck price of the mini doughnut is around $.60, representing an ROI (Return on Investment) of a staggering 1,900%. The company claims its overall average food cost is about 10%, way below the 25% average food costs at typical quick-serve restaurants. 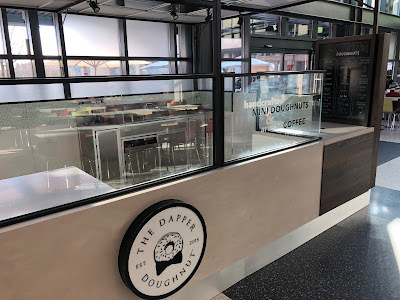 Despite its closure, the Lenox Square location, as well as closed shops in Haywood Mall in Greenville, South Carolina and in Natick Mall in Natick, Massachusetts are all still listed as open locations on The Dapper Doughnut website. 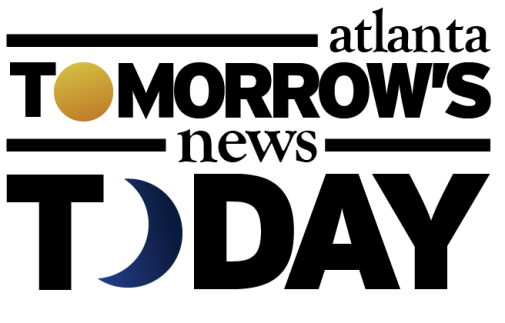 All three were open for rather short periods of time, too, with the Haywood Mall location having opened October 2017 and Natick, just this past June. In Lenox Square, The Dapper Doughnut joined an already robust variety of dessert/snack options including Sugarfina (candy), Great American Cookies, Sprinkles (cupcakes, cookies and ice cream), Godiva Chocolatier, Amorino (gelato), Bubbleology (bubble tea), Starbucks(2), Pinkberry (frozen yogurt), Häagen-Dazs (ice cream), Garrett Popcorn, Sweet Hut Bakery, Auntie Anne's (pretzels), Woops! Macarons, and La Fete Chocolat, among others. In the months since Dapper's debut, Sprinkles, Bubbleology and Pinkberry all closed in the mall. A portion of Sprinkles has reopened as Daily Dose by The Merchant, a pop-up coffee shop, but will eventually become part of an expanded and relocated Apple store. Bubbleology, which operated from a kiosk in the middle of the mall, has not been replaced by anything, while Pinkberry was replaced with a new shop-in-shop Finish Line at Macy's. Did you ever try The Dapper Doughnut? Do you prefer mini or traditionally sized doughnuts? Where is your favorite place to get doughnuts in metro Atlanta? It's always sad to see someone invest so much time, money, energy, then see it fail. I tried to buy donuts from this place once, and the gruff worker (probably owner, as he was older) told me to come back in 10 minutes when he was ready to start serving, even though it was past their stated opening hours. It just seems like such a massive waste of time, energy, resources, and mental capacities to open something and then close it 9 months later. What kind of data could you possibly capture in only 9 months time? They must have been absolutely terrible at doing business. Folks, don't go into a business you're not passionate about. It makes no sense. If Anonymous January 26 @2:46PM's experience is any indication, I would say they were pretty terrible at doing business. Isn't everyone in Buckhead on the Keto diet? I live very close to Revolution Doughnuts, not Keto and I haven't had a donut in over a year. It's a hard enough sell without the handicap of poor entrepreneurial skills.